As a proud, card-carrying #watchnerd, I must sheepishly admit that although the Luminox moniker is instantly recognizable, sadly, I knew little of the brand’s history. Luminox (Lumi: Latin for light, Nox: Latin for “night”) began manufacturing watches in 1989. The company’s initial and continuing mission is to bring cutting-edge luminescence and readability to tool/sports watches. With this in mind, the company developed its own illumination system, designated Luminox Light Technology (LLT). Since it’s inception, Luminox‘s impressive partnerships with military and law enforcement around the world should speak volumes about the brand’s reliability. The Navy SEALs, US Coast Guard, NYPD, Singapore Air Force, Special Military Forces Israel, and the US Air Force/Lockheed Martin have all procured watches with Luminox. The brand is also trusted and requested by many more Law Enforcement Groups, Police and Fire Departments as well as other elite forces around the globe (too many to list believe it or not). The cornerstone of Luminox’s mission and technology is quite interesting. The cornerstone of Luminox’s mission and technology is quite interesting. Luminox Light Technology (LLT), is not your regular horological lume. It is surprisingly a self-powered illumination system that uses small of amounts of radioactive gas, contained safely in mini tubes. The glow offers exceptional night or dark condition reading. 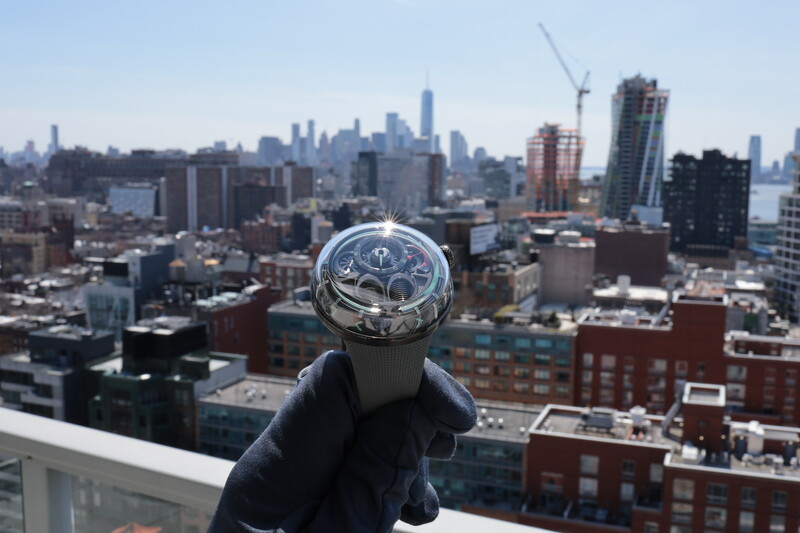 The company claims this guarantees unsurpassed legibility for up to 25 years, independent of a light source to “charge” luminous material as in most modern timepieces. Being reviewed here is the Swiss made, Luminox Modern Mariner Automatic (Ref. 6502.BO) having a retail of $1,350. The Mariner is a part of Luminox’s current Sea Collection. It uses a Swiss made Sellita SW 220-1 automatic movement with a power reserve of up to 38-hours. These are based on the SW200 caliber, but have an added wheel for the day of the week, therefore offering the time, date, and day of the week display. This movement can be considered analogous to the ETA 2836. On par with Luminox’s quintessential rugged look, the Mariner’s case measures in at 45 mm with a thickness of approximately 15 mm. Add to that it’s 24 mm lug width, this particular model is definitely created for larger wrists, a factor that must be considered when purchasing. In this author’s advice, a minimum of a 6 and 7/8 inch wrist and larger would be a comfortable fit. 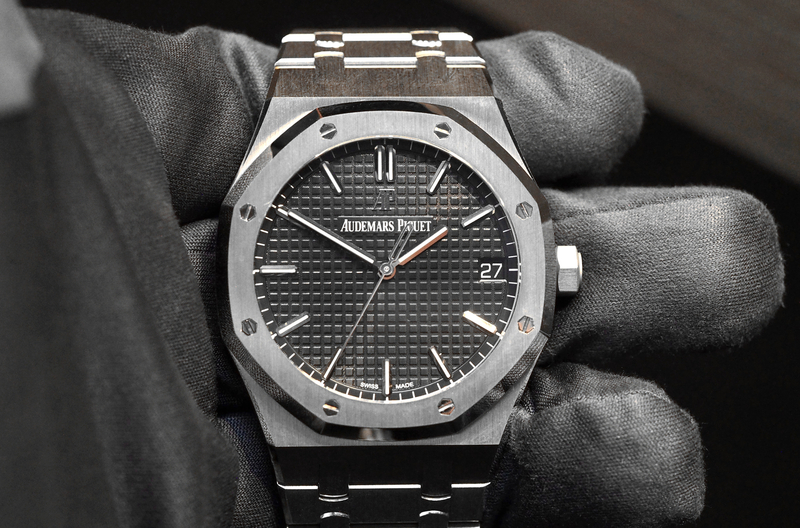 The watch with all bracelet links weighs in at a robust 220 grams. 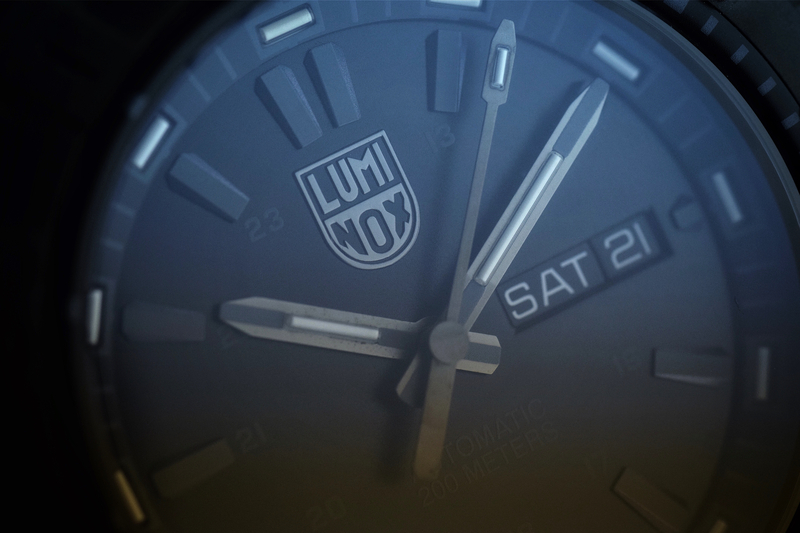 For those born in the Superluminova era, the famed Luminox lume does not burn with that clandestine intensity. Instead, seen with tritium tube systems, the LLT burns “slow and low”. It will not blow you away with its power. That being said, given it’s independence of a light source or button to push to illuminate as well as it’s multi-color display (the Mariner includes green, orange, yellow, blue and white LLT as well as Superluminova), the Luminox Mariner provides consistent legibility in low light, without worry of annoyance or detection. This type of display is especially suited for tactical and dive settings (or perhaps more likely for many, when needing to check the time during a packed movie or flight ). A 24-hour scale on the dial discretely provides a preference many in military service use as they go by 24-hour military-time, instead of 12-hour time. The hands and hour markers are a gray color with a different texture than the dial in order to preserve legibility on this “blackout” model (what “BO” in the reference model stands for). This, along with the matte finish of the dial, may make it more legible than the standard silver stainless steel model given the polished and glossy elements on that dial. This is not usually said of the black model variant. The 6502.BO Modern Mariner Automatic has a black PVD-plated stainless steel case and bracelet, not to be confused with Luminox’s Carbonox material used in other models. “Carbonox” is an innovative carbon substance fabricated and used by Luminox resulting in a very strong, durable lightweight timepiece. If this innovation were to be used for this model, a substantially greater range of wearability would be provided at the current size offering in this author’s opinion. The Mariner’s screw case back, screw down protected crown, unidirectional ratcheting bezel and most importantly, 200 meters of water resistance, complete most dive watch checklists. 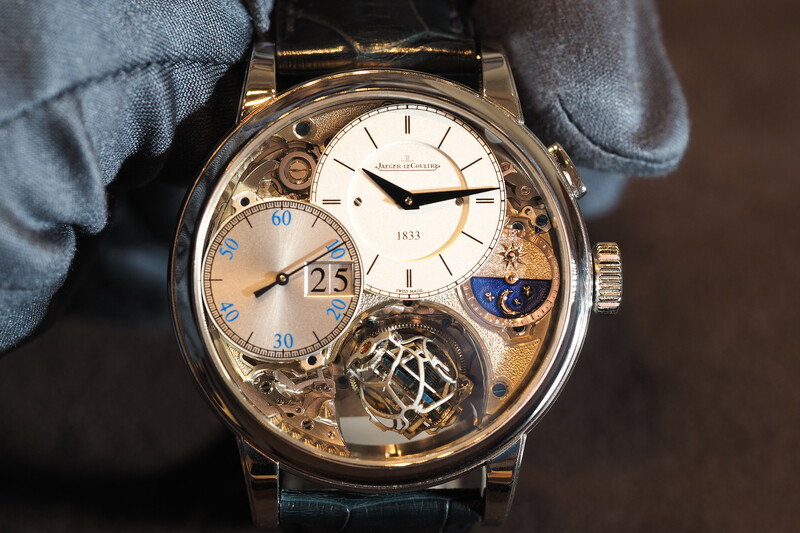 The antireflective sapphire crystal and sapphire display case back make it easier to both admire and photograph. The Luminox 6502.BO should be considered a durable, dependable and extremely legible automatic sports watch that could possibly work with more formal attire on larger wrists. Particularly if you have diving or tactical needs for work or recreation, the Modern Mariner Automatic should prove to be a good choice. Next articleNewsHave Rolex customizers gone too far with a Milgauss Tourbillon?